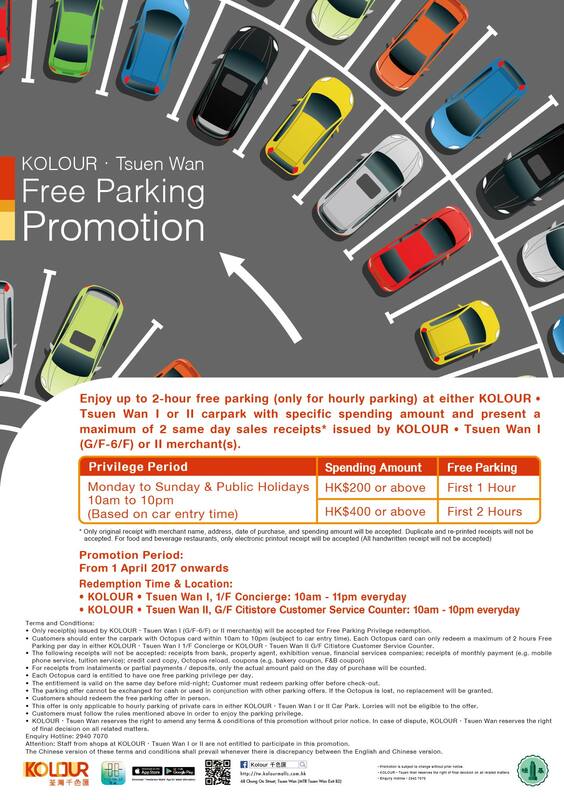 Enjoy up to 2-hour free parking (only for hourly parking) at either KOLOUR•Tsuen Wan I or II carpark with specific spending amount and present a maximum of 2 same day sales receipts* issued by KOLOUR•Tsuen Wan I (G/F-6/F) or II merchant(s). 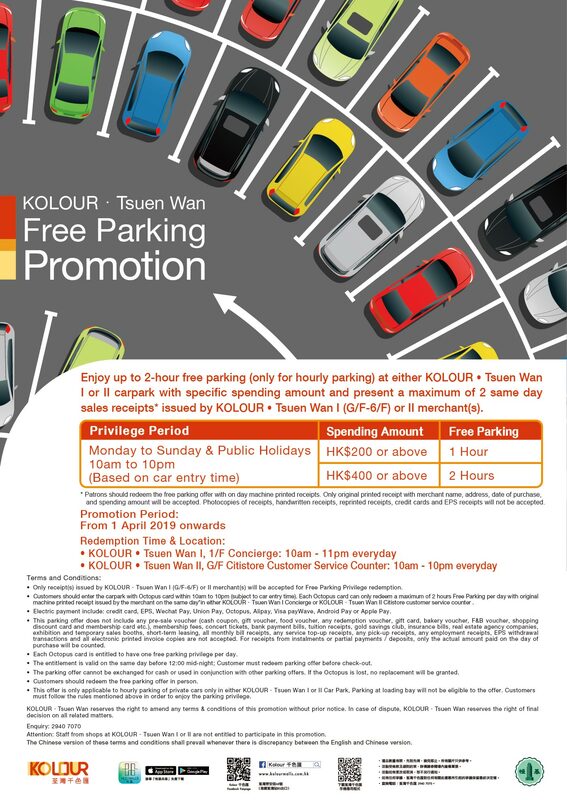 Starting from 1 April 2019, only a maximum of 2 electronic printout receipts on the same day is accepted to enjoy designated free parking offer, all handwritten receipts are not acceptable. *Patrons should redeem the free parking offer with on day machine printed receipts. Only original printed receipt with merchant name, address, date of purchase, and spending amount will be accepted. Photocopies of receipts, handwritten receipts, reprinted receipts, credit cards and EPS receipts will not be accepted. The contents contained in this website are copyright protected. Except with the prior written permission of Henderson Real Estate Agency Limited (KOLOUR • Tsuen Wan I), Henderson Leasing Agency Limited (KOLOUR • Tsuen Wan II) and/or other relevant copyright owner, no person may download, duplicate, reproduce, edit, publish, make available or disseminate through whatever means this website or any content contained in whole or in part. All hyperlinks to this website require prior written application to and the approval in writing by Henderson Real Estate Agency Limited. All information and content contained in this website are provided solely for general information and reference purposes. Henderson Real Estate Agency Limited (KOLOUR • Tsuen Wan I), Henderson Leasing Agency Limited (KOLOUR • Tsuen Wan II) makes no statement, representation, warranty or guarantee as to the accuracy, reliability or timeliness of the information and content contained in this website. (iii) any person to whom we are under an obligation to make disclosure under the requirement of any law binding on us or for the purposes of any guidelines or codes of practice issued by regulatory or other authorities with which we are reasonably expected to comply.